This edition of the city simulator for the Mac includes previously-released expansion packs. You’re really going to have to build a new grammar school, add some residential housing and take care of that giant monster that just demolished City Hall this week. So goes life within SimCity: Complete Edition ($30; available on Amazon and the App Store, the latest version of SimCity, which arrives complete with additional expansion packs such as the Cities of Tomorrow, Amusement Park, and Heroes and Villains expansion sets. 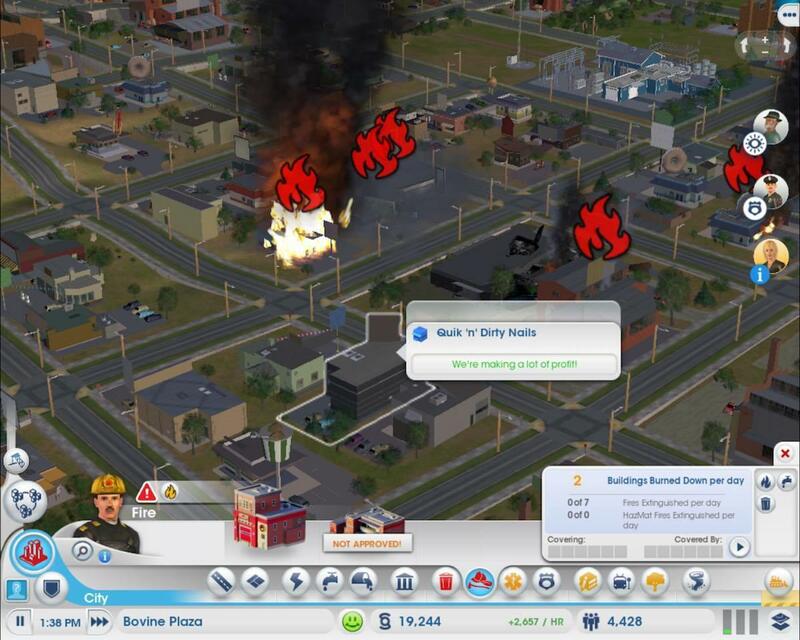 SimCity: Complete Edition places you in the role of Mayor of your own city, which you build from the ground up and attempt to keep running smoothly, no matter what happens. Simply choose a region, choose your city’s location, then begin laying down your first roads, assigning commercial, residential, or industrial zones and watch your city spring to life. Like all cities, you’re going to have issues that need to be addressed. Roads will need to be built and upgraded, services will need to be provided, medical care, water, and power facilities will need to be available to everyone, and you’ll have to figure out a way to make money for your city without going into debt. Be sure to build enough waste disposal stations to keep your citizens happy. All of this is wrapped in an attractive package worthy of the SimCity tradition. Great graphics, energetic music, and addictive gameplay draw you in. The controls and camera systems feel responsive and a helpful tutorial shows you the basics in less than 20 minutes. For the first time, you’re now able to trade with other cities in your region, selling products, services, and extra capacity from utilities like water and power to boost your finances on the side. 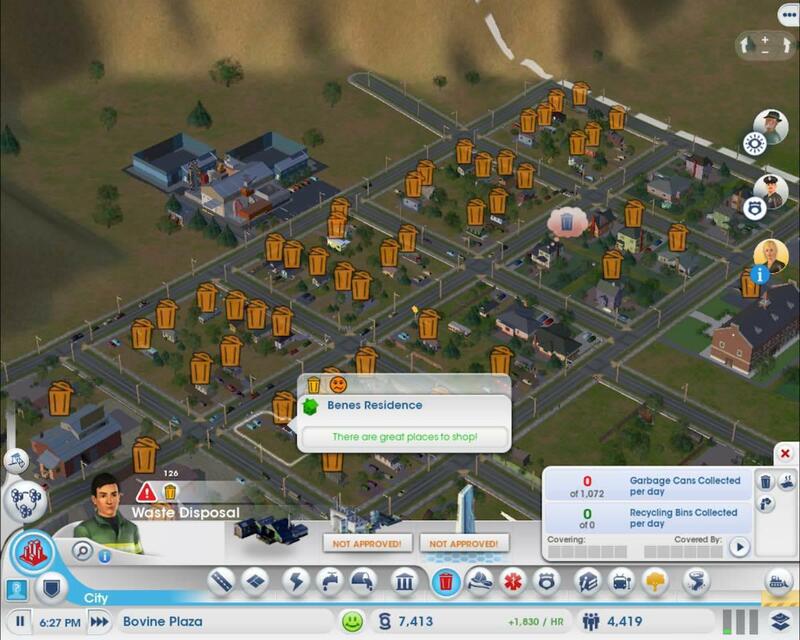 Even if you’re new to SimCity or have taken a long hiatus from the series, it’s easy to get drawn in. Once you’ve named and founded your city, there’s an irresistible pull to get to the next level, hit the next population marker, upgrade your buildings, and complete missions for bonuses. It’s here, when your city might be facing a declining population or is on the brink of financial ruin, that you’ll learn to take risks, build new neighborhoods, and watch your citizens either rejoice or protest in anger. And don’t forget the disasters—you can always shake things up with a fire, an earthquake, or an alien or zombie invasion and see how your citizens handle an unexpected catastrophe. Sometimes things catch fire. 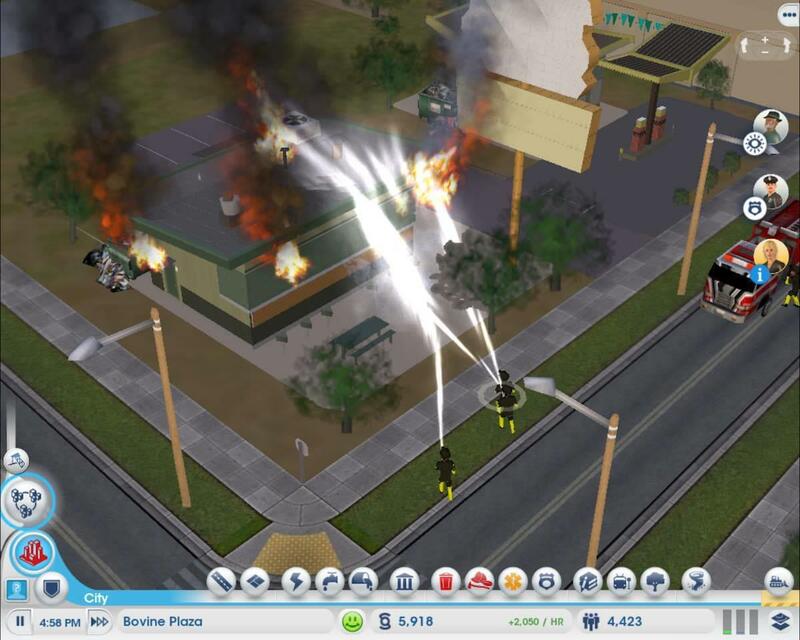 Make sure you have enough fire stations to deal with inevitable, toasty disasters. Unfortunately, there are some wrinkles to iron out. The maps feel smaller than they should and you’ll find yourself wanting a larger area to expand into, the game pushing you to continuously upgrade your city to house its growing population. At present, it feels tricky to associate with other cities in your region and a better tutorial for this would be appreciated. Where technical concerns arose, I found myself unable to change the game’s detail levels during gameplay and the animation staggered for several seconds when the giant monster began stomping through my city during my testing of version 1.0.2 of the game. 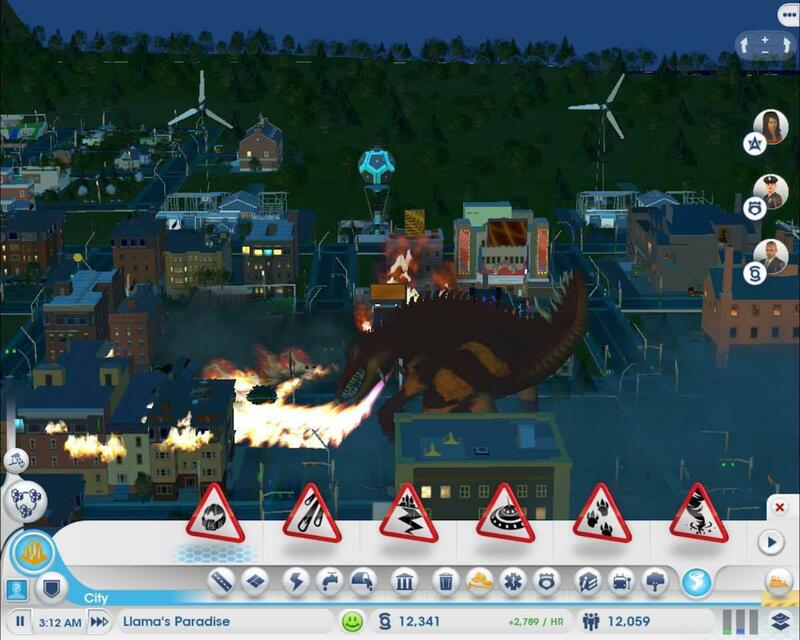 What would a SimCity game be without giant, fire-breathing monsters, aliens and other horrifying disasters waiting to be unleashed? Even with these caveats, you still get a good amount of content and replay value for the game’s $30 price tag. And, in cases where you make a crucial mistake—such as my purchasing a nuclear power plant without the required environmental filters and accidentally irradiating a third of my city when it failed, thereby decimating my infrastructure and economy and destroying the city of New Llama—you want to go back and do things that much better next time. Now to start another city without, you know, accidentally irradiating an entire neighborhood this time.